A Complete Audio/Video Program To Inspire You To Step Into Your Birthright: Unlimited Joy! In just 2 to 10 minutes each morning, during your workout, meditation or contemplation time, you learn to overcome every obstacle and discover Unlimited Joy. drop their lifelong loyalty to mind’s incessant thinking and embrace who we all truly are in our hearts: Unlimited Joy, Kindness, Compassion & Inner Peace. Simple Heart Tools reconnect us quickly with the Unlimited Joy, Love, Kindness & Inner Peace that is our Birthright and upgrade our quality of life forever. As Author, Licensed Therapist, Lecturer, Workshop Leader and former College Professor, I am passionately committed to giving people quick, practical ways to bring freedom and inner peace into their busy lives. After thirty years of bringing Buddhist wisdom and Body-Centered Therapy to help clients with chronic pain, depression, anxiety, illness, insomnia, midlife changes and marital issues, I have watched thousands of people, young and old, discover inner peace by awakening these ten powerful Heart Choices. 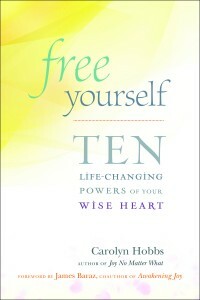 Listen to Carolyn describe how the Powers of Curiosity and Compassion lead to freedom in her new book, FREE YOURSELF: 10 Life-changing Powers of your Wise Heart. You can now awaken your inherent capacities for unlimited Joy, Kindness, Compassion and Inner Peace during your morning meditation, workout or spiritual practice by using one of the four quick, easy Heart Tools following each chapter. Since every human is born with these ten heart powers, readers of all faiths and ages experience increased joy, freedom and inner peace by practicing one of these ten Heart Choices daily. Though the voice of our heart may be buried beneath the shouts of our ego and the clamor of our worries, our heart already possesses all the characteristics of the person we want to be in the world — it’s trusting, curious, aware, resourceful, compassionate, kind, grateful, forgiving, truthful, and peaceful. And when we listen deeply, we can access these Heart Powers and easily practice them at work and home in our daily relationships. By spending a few minutes making such core beliefs as “I’m unworthy, unimportant, unlovable and not good enough” conscious, we stop feeding ego’s reactions and gift ourselves with moment-to-moment choice. Conscious choice brings awareness and freedom. In an encouraging, uplifting voice, therapist Carolyn Hobbs draws from her thirty-plus years of counseling and meditation practice to deliver the liberating truth: each of us has within ourselves the power to release ourselves from fear, doubt, judgment, shame, past trauma, jealousy, anger, resentment, defensiveness and other habitual reactions. All we have to do is listen to our wise hearts. Each chapter in this gentle, pragmatic book focuses on a single power of our heart and contains illustrating examples drawn from real life. Hobbs concludes each chapter with clear tools we can use to develop and apply these strengths amid the challenges of daily life. Busy people of all faiths will be able to use these tools to find freedom and inner peace — to tame anxiety, anger, grief, and despair while awakening fearless love. Warm and inspiring, Free Yourself maps the path to lasting peace and freedom — a path that absolutely anyone can follow, as the way lies within our own hearts. Add Joy Today to your Daily Life, no matter what you face. In two minutes, practice 3 Simple Choices–Saying “Yes” to What Is, Witnessing Reactions & Choosing Wisely–amidst the ups and downs of everyday life. Stop postponing the Unlimited Joy you are born with. And treat Family & Friends to more Joy this Holiday Season. 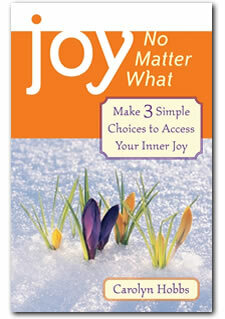 Go to ITunes, Audible.com or Amazon.com JOY No Matter What and order your “JOY No Matter What” Audio version now. Shoshana Alexander, coauthor of Awakening Joy. Carolyn Hobbs offers readers a guide for awakening heart wisdom that arises from her years of healing work with others—and her own deep understanding. Free Yourself is filled with poignant vignettes, meditative practices, and reflections that help us to inhabit our lives with the fullness of loving presence. —Tara Brach, PhD, author of Radical Acceptance and True Refuge. A fine and trustworthy guide for healing and heart-centered living! With a supportive and compassionate tone, Ms. Hobbs helps us believe that any one of us, no matter how self-limited or wounded we might be, can finally live with majesty and joy. Free Yourself is hands-down one of the most empowering books I’ve read in a very long time, definitely a must-have for your personal growth/spiritual growth library. Like a warm and helpful conversation with a wise friend over a cup of tea, Free Yourself wraps the wisdom teachings in stories, humor, and suggestions that gently nudge us toward the freedom inherent in every beat of our heart. Listening will definitely change your life! For six years, while promoting my prior book, JOY, No Matter What (Conari, 2005, which sold over 12,000 copies in the U.S., Canada and abroad), readers kept asking for fresh ways to feel free and peaceful in these tumultuous times. Published in five languages, JOY sold nearly 2,000 copies in Spain, Central and S. America, 2,500 in China, 1,000 in S. Viet Nam and 1,000 in Taiwan. Since 2005, I have taught Joy at national and international conferences and on 400 radio shows throughout U.S. cities. Joy, No Matter What shows us that joy is not something “out there,” available only to the lucky few born with emotional silver spoons in their mouths. We all have joy at our core. No matter what’s going on in our lives, we can uncover our innate joy and bring it into the light of our everyday lives. Carolyn Hobbs has worked with thousands of people in individual and couples’ therapy, workshops, and graduate courses. She has helped people face depression and anxiety, handle chronic pain and life-threatening diseases, overcome addictions, cope with life transformations–and still find their own joy and freedom in the midst of whatever life throws their way. Choosing Joy is as simple as 1, 2, 3. Choosing Freedom begins now amidst the chaos, overwhelm and stress of our busy, full lives. Feel free to contact me to schedule phone therapy sessions on Joy and Freedom or for questions about the books. Reach my office at 970/259-3537 or by email at chobbs100@frontier.net. **Self-Forgiveness & Forgiving Others: National Radio Interview 3/31/16 with SF-Bay Area Radio Personality Ilene Dillon.